You may be thinking, Brussels sprouts are those yucky, bitter green things your mom used to make you eat. These little sprouts might have a bad reputation but we’re here to prove they can be absolutely delicious if cooked properly. 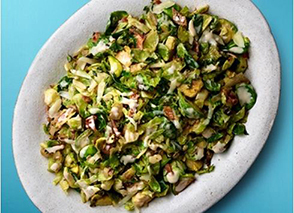 Before you revert back to your distaste for Brussels sprouts, give our tips and recipes a try. We promise, you will be pleasantly surprised. 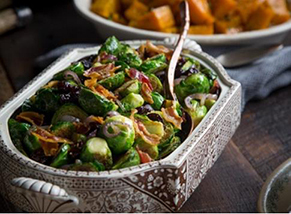 When selecting the right Brussels sprouts look for tightly compacted leaves and bright green color. You should avoid any with brown or discolored spots. If you are purchasing pre-packaged bagged sprouts, avoid bags that contain a lot of moisture as they tend to be softer and will spoil faster. Sizing makes a difference in taste. 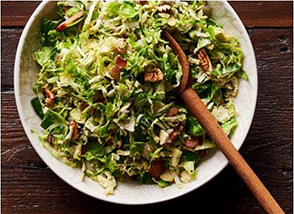 Large Brussels sprouts begin to take on cabbage qualities and tend to have a bitter taste, which is okay depending on how you plan to prepare them. The small sprouts will be a bit sweeter. Always start with washing your vegetables. It is a good habit to get into even if they are packaged. Once washed and shaken dry, trim the thick stem at the base of the sprout. You do not need to remove the whole stem because it will cause your bunched leaves to fall apart. Before cooking, remove any browned or withered leaves. Based on how you plan to cook them, you will either leave whole, slice or shred them. When roasting Brussels sprouts, remember to leave them a little longer in the oven. The edges will quickly turn brown, but that’s the best part. 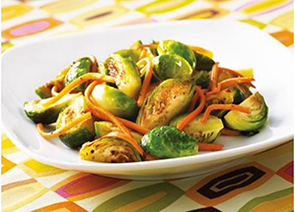 Overcooking Brussels sprouts a bit brings out the delicious flavors. 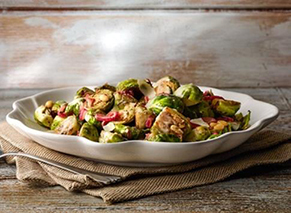 Brussels sprouts are just as tasty raw. Try shredding (similar to coleslaw) and adding your favorite vinaigrette. Let sit for 15 minutes to allow the leaves to absorb the dressing and become a little softer. Try these recipes from our Aprons chefs! Don’t give up on one of our favorite side dish vegetables. We are hoping to change the reputation one delicious dish at a time. Try some of these different cooking methods and recipes and share your favorite with us in the comments below.